We decided to renovate our house this year, and the project has taken over our life. Almost every spare minute lately you can find me painting something inside our house or sorting through closets, sometimes late into the evenings. And trying to do all that with four children under five years old? Needless to say, it has been slow going. We are finally starting to see the light at the end of the tunnel – just in time for all the good busyness that comes with summer! I had good intentions of starting a more structured family devotions time with my kiddos this year, but my good intentions were lost between adjusting to becoming a family of six and all these projects. I fall into bed many nights and realize that the devotion books have gone untouched, the little craft to go with the lesson hasn’t been done. Scripture tells us to teach our children about the Lord at every time of day, not just at a designated family devotion time. Family devotions are a wonderful way to really drive home those lessons, but it’s more important to use every opportunity to teach our kids God’s truth by living our lives for Him. During busy days when there just doesn’t seem to be a good time to sit down for devotions, look for those quiet moments in your day. Even the busiest day has some quiet moments, and I think they are very under-utilized opportunities to have “mini family devotions”. 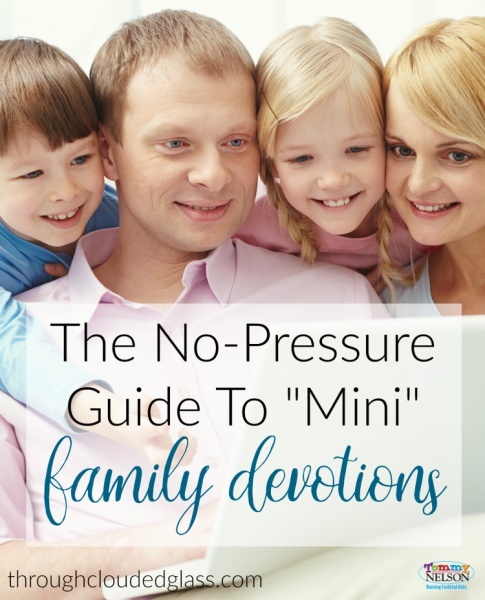 Mini family devotions, as I am calling them, can be as simple as reading a short Scripture together, working on Bible memory verses, singing Christian songs and talking about what the lyrics mean. It might be pointing out cool facts about creation and reminding our children of the Creator, talking about a news story and praying for the situation, or taking the extra minute during discipline to explain from the Bible why something is wrong. These moments add up. Our children are smart, and by incorporating our faith into everyday occurrences we are teaching them that our walk with the Lord is not just about paying attention in church and going on with our week – it is about living each day to the glory of our Savior. These are a few quiet moments that we often find in our days, and I hope they give you some ideas for your own mini devotions! When You Rise Up – On most of our busy days, there is usually still some sort of pause to eat breakfast. Instead of rushing around while the kids eat, this would be a great time to sit down with my kids and read a short Bible story. 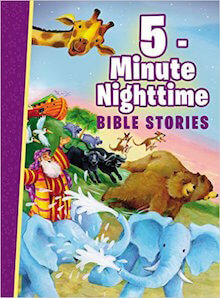 The new book, Five Minute Nighttime Bible Stories is perfect for this (any time of day)! Each story is split into short segments, so you can read anywhere from 2-10 minutes and still get a full story in. When You Sit In Your House – I don’t know about you, but most of the time when I’m sitting in my house, I’m watching TV. My oldest is getting to the age where he will watch some family-friendly shows with us at night. Instead of my default, which is to temporarily turn into a TV-watching vegetable, this would be a great time to look for lessons in the story line that I can use to point my son back to the Lord. And void of any clear lesson, there are commercial breaks! We avoid commercials as much as possible in this house, so with the TV muted this might be a good time to review memory verses or sing a Bible song. I’m still brainstorming here, but I am confident that with a little intention that TV time could be pretty productive. When You Walk (Drive) Along The Way – Car time must be the most underutilized devotion time of all, and it’s such a shame, because this is when we are consistently all together with nothing to do! You can’t read a devotion in the car, but you can verbally tell a Bible story, review Bible verses, or play Christian music that your kids enjoy and talk about which songs are your favorite and why. When You Lie Down – Ever since my firstborn came home from the hospital we have been in the habit of doing a short devotion before bed. Nothing fancy, just a Bible story, maybe memory verses, a prayer, and a song. It takes all of five minutes, but my kids have come to rely on it, and as long as we stick with our habit I know that no matter how busy our day gets, there will be time to refocus on the Lord before bed. What are some quiet moments in your day? Is there a way to use that time to refocus your family on Jesus? I’d love to read your ideas! This entry was posted in Blog, Tommy Nelson and tagged Bible reading, Bible Teaching, Devotions, Family, Family Devotions, Parenting by Callie Nicole. Bookmark the permalink.